Cold war with Russia and China could turning hot. The risk of unthinkable war between nuclear armed states is real. “(i)f China wants to avoid an all-out cold war with the United States and its partners, it must fundamentally change its behavior,” citing Mike Pence as the source of the view expressed. It’s a policy position Beijing strongly rejects, wanting cooperative relations with all other nations, but unwilling to bow to unacceptable demands of any – especially nothing compromising its fundamental sovereign rights. Pence is representing the Trump regime in Singapore at the November 11 – 15 Association of Southeast Asian Nations (ASEAN) summit. Major Sino/US political, economic, financial, trade and military differences persist, resolving them unlikely any time soon. China’s Xi Jinping reportedly won’t meet Pence at the ASEAN summit. He’s scheduled to meet with Trump on the sidelines of the November 30/December 1 G20 summit in Buenos Aires, Argentina. Prospects for a deal between both leaders, resolving longstanding differences are virtually nil. China rejects unacceptable US demands. According to Pence, if Xi refuses to accept them, Washington will escalate political, economic, and perhaps military pressure on the country. Washington’s Indo/Pacific strategy is all about seeking regional dominance by whatever it takes to achieve its aims – not an encouraging sign going forward. It “risks” Washington’s ability to dominate the Indo/Pacific region unchallenged, wanting Russia and China marginalized, weakened, contained and isolated – a strategy doomed to fail. US policy involves pressuring other nations to deal with America, not China or Russia, economically, warning them against accepting investments from China and Russia in their countries, nor normalized trade relations, the same true for Iran. 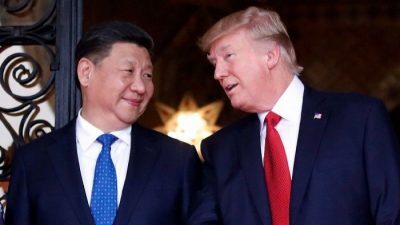 Unlike one-way US investments, exploiting trading partners, Chinese investments benefit both sides equitably, why its gaining economic partners worldwide at Washington’s expense. US efforts to undermine China, Russia, Iran, and other independent countries economically and in other ways are counterproductive. They haven’t worked before and won’t ahead. They make more enemies than allies longterm. They’ll damage bilateral relations more than already, risking possible confrontation.